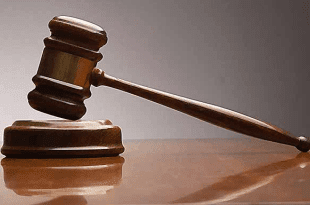 A 35-year-old man, Uche Chukwuka, who allegedly battered his wife and threw her down a two-storey building, appeared before a Yaba Chief Magistrates’ Court in Lagos on Wednesday. The accused, residing at No. 22 Railway Line in Idi-Oro, Mushin, Lagos, is standing trial on a two-count charge bordering on assault. Chukwuka, however, pleaded ‘not guilty’ to the charges preferred against him. The Prosecutor, Inspector Godwin Oriabure, told court that the offence was committed on June 20 at about 7:30p.m. at the residence of the accused. He explained that the accused committed the offence, following a heated argument with his wife, which led to a fight. “The accused beat up his wife and pushed her from a two-storey building, which caused her grievous body harm,” Oriabure stated. He said the offences contravened sections 170 (a) and 173 of the Criminal Law Cap Ch, C17, Vol.3 Laws of Lagos State Nigeria, 2015. The magistrate, Mr. O.S. Aka-Bashorun, granted bail to Chukwuka in the sum of N500,000, with two sureties in like sum. He said that one of the sureties must be a community leader or Eze Ndigbo, whose name must be in the gazette of the Lagos State Government. He adjourned the case until August 8 for substantive trial.